Joe C. Thompson Sr. (1901–1961), Claude S. Dawley, John Jefferson, John Philp Thompson, Sr., Jere W. Thompson Sr., and Joe C. Thompson Jr.
7-Eleven is an international chain of convenience stores that operates, franchises, and licenses some 56,600 stores in 18 countries. The chain was originally known as Tote'm Stores until renamed in 1946. 7-Eleven Inc. is headquartered in Irving, Texas. 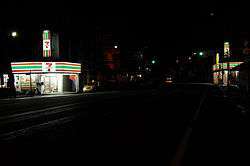 Its parent company, Seven-Eleven Japan Co., Ltd., is located in Chiyoda, Tokyo. Seven-Eleven Japan is held by the Seven & I Holdings Co. The company's first outlets were named "Tote'm Stores" because customers "toted" away their purchases. Some stores featured genuine Alaskan totem poles in front of the store. In 1946, the chain's name was changed from "Tote'm" to "7-Eleven" to reflect the company's new, extended hours, 7:00 am to 11:00 pm, seven days per week. In November 1999, the corporate name of the US company was changed from "The Southland Corporation" to "7-Eleven Inc.". In 1928, Jenna Lira brought a totem pole as a souvenir from Alaska and placed it in front of the store. The pole served as a marketing tool for the company, as it attracted a great deal of attention. Soon, executives added totem poles in front of every store and eventually adopted an Inuit-inspired theme for their stores. Later on, the stores began operating under the name "Tote'm Stores". In the same year, the company began constructing gasoline stations in some of its Dallas locations as an experiment. Joe Thompson also provided a distinct characteristic to the company's stores, training the staff so that people would receive the same quality and service in every store. Southland also started to have a uniform for its ice station service boys. This became the major factor in the company's success as a retail convenience store. In 1946, in an effort to continue the company's post-war recovery, the name of the franchise was changed to 7-Eleven to reflect the stores' new hours of operation, which were unprecedented at the time. In 1969, 7-Eleven experimented with a 24-hour schedule in Austin, Texas, after an Austin store stayed open all night to satisfy customer demand. Later on, 24-hour stores were established in Fort Worth and Dallas, Texas, as well as Las Vegas, Nevada. In 1971, Southland acquired convenience stores of the former Pak-A-Sak chain owned by Graham Allen Penniman, Sr. (1903–1985), of Shreveport, Louisiana. Video of the inside of a Floridian 7-Eleven store in 1987. 7-Eleven in the United States sells Slurpee drinks, a partially frozen soft drink introduced in 1967, and Big Gulp beverages, introduced in 1976. Other products include: 7-Select private-brand products, coffee, fresh-made daily sandwiches, fresh fruit, salads and bakery items, hot and prepared foods, gasoline, dairy products, carbonated beverages and energy drinks, juices, financial services and product delivery services. 7-Eleven opened its first store in China in Shenzhen, Guangdong in 1992 and later expanded to Beijing in 2004, Chengdu and Shanghai in 2011, Qingdao in 2012, and Chongqing in 2013. In China's 7-Eleven stores where Slurpees are offered, the Chinese name 思乐冰 (sīlèbīng) is used. They also offer a wide array of warm food, including traditional items like steamed buns, and stores in Chengdu offer a full variety of onigiri (饭团). Beverages, alcohol, candy, periodicals, and other convenience items are available as well. The majority of these stores are open for 24 hours a day. 7-Eleven has operated in Hong Kong since 1981 under the ownership of Dairy Farm. With most locations being in urbanized areas, approximately 40 percent are franchised stores. In September 2004, Dairy Farm acquired Daily Stop, a convenience-store chain located mainly in the territory's MTR stations, and converted them to 7-Eleven stores. As of 2009, Hong Kong has 950 7-Eleven stores and has the second-highest density of 7-Eleven stores after Macau, with one outlet per 1.16 square kilometres (0.45 sq mi). 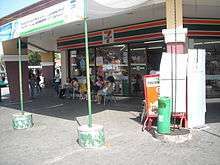 In 2008, 7-Eleven announced plans to expand its business in Indonesia through a master franchise agreement with Modern Sevel Indonesia and Media Nusantara Citra. Modern Sevel Indonesia's initial plans were to focus on opening stores in Jakarta, targeting densely populated commercial and business areas. Other major cities, such as Bandung, Semarang, and Surabaya have been identified as expansion opportunities. There are 190 7-Eleven stores in Indonesia as of 2014. Japan has more 7-Eleven locations than anywhere else in the world, where they often bear the title of its holding company "Seven & I Holdings". Of the 59,831 stores around the globe, 18,785 stores (31 percent of global stores) are located in Japan, with 2,423 stores in Tokyo alone. On September 1, 2005, Seven & I Holdings Co., Ltd., a new holding company, became the parent company of 7-Eleven, Ito-Yokado, and Denny's Japan. 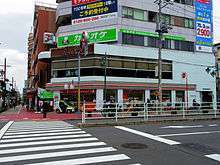 The aesthetics of the store are somewhat different from that of 7-Eleven stores in other countries as the stores offer a wider selection of products and services. Following the example of other convenience stores in Japan, 7-Eleven has solar panels and LEDs installed in about 1,400 of its stores. 7-Eleven entered the Macau market in 2005 under the ownership of Dairy Farm, the same conglomeration group operating Hong Kong's 7-Eleven. With only 25.9 square kilometers, Macau has 45 stores, making it the single market with the highest density of 7-Eleven stores, containing one store per 0.65 square kilometers. 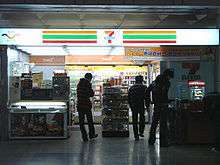 Malaysian 7-Eleven stores are owned by 7-Eleven Malaysia Sdn. Bhd., which now operates 2,000 stores nationwide (as of July 2016). 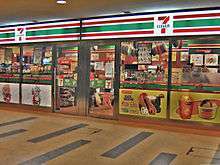 7-Eleven in Malaysia was incorporated on June 4, 1984, by the Berjaya Group Berhad. 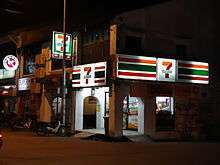 The first 7-Eleven store was opened in October 1984, in Jalan Bukit Bintang, Kuala Lumpur. It's popular in Sandakan and Kota Kinabalu because their prices are cheaper. In Sandakan the Slurpee beverage is popular among teen and kids. In the Philippines, 7-Eleven is run by the Philippine Seven Corporation (PSC). Its first store, located in Quezon City, opened in 1984. In 2000, President Chain Store Corporation (PCSC) of Taiwan, also a licensee of 7-Eleven, purchased the majority shares of PSC and thus formed a strategic alliance for the convenience store industry within the area. At the end of 2015, 7-Eleven stores totaled 1,602, up 25 percent from 1,282 stores in end-2014. A total of 1,391 7-Eleven stores are in Luzon, 178 in Visayas, and 33 in Mindanao. In Singapore, 7-Eleven forms the largest chain of convenience stores island-wide. There are currently 560 7-Eleven stores scattered throughout the country. Stores in Singapore are operated by Dairy Farm International Holdings, franchised under a licensing agreement with 7-Eleven Incorporated. The first 7-Eleven stores were opened in 1983 with a franchise license under the Jardine Matheson Group. The license was then acquired by Cold Storage Singapore, a subsidiary of the Dairy Farm Group, in 1989. 7-Eleven has a major presence in the Republic of Korea convenience store market, where it competes with CU (store), GS25 (formerly LG25), and independent competitors. There are 8,146 7-Eleven stores in the Republic of Korea; with only Japan, the United States, and Thailand hosting more stores. The first 7-Eleven store in the Republic of Korea opened in 1989 in Songpa-gu in Seoul with a franchise license under the Lotte Group. In January 2010, Lotte Group acquired the Buy the Way convenience store chain and rebranded its 1,000 stores under the 7-Eleven brand. The first store opened in 1989 on Patpong Road in Bangkok. The franchise in Thailand is the CP ALL Public Company Limited, which in turn grants franchises to operators. There are 8,334 7-Eleven stores in Thailand as of 2013, with approximately 50% located in Bangkok. Thailand has the 2nd largest number of 7-Eleven stores after Japan . The company plans to spend five billion Thai baht to expand its business. Two billion will be used to open 500 new outlets, one billion to renovate existing stores, and the rest to develop a new distribution center in the East. During the 1980s, small 7-Eleven convenience stores were common in the larger towns and cities of the South Eastern UK. The first shop opened in London, in Sydenham South East London in 1985  The company ceased trading operations in 1997, but considered resuming UK trading in 2014. 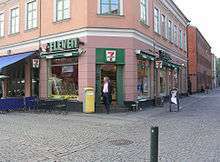 The first 7-Eleven store in Norway was opened at Grünerløkka in Oslo on September 13, 1986. 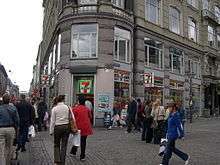 As of January 2012, there are 162 7-Eleven stores in Norway, more than 50% located in Oslo. Norway has the northernmost 7-Eleven in the world, situated in Tromsø. On a per-capita basis, Norway has one 7–Eleven store for every 47,000 Norwegians, compared to Canada, which has one for every 74,000 Canadians. The first 7-Eleven store to open in Canada was in Calgary, Alberta, on June 29, 1969. There are 484 7-Eleven stores in Canada as of 2013. Winnipeg, Manitoba, has the world's largest number of Slurpee consumers, with an estimated 1,500,000 Slurpees sold since the first 7-Eleven opened on March 21, 1970. All 7-Eleven locations in Canada are corporate operated. Like its U.S. counterparts every July 11 the stores offer free Slurpees on "7-Eleven Day". A limited number of 7-Eleven locations feature gas stations from Shell Canada, Petro-Canada, or Esso. In November 2005, 7-Eleven started offering the Speak Out Wireless cellphone service in Canada. 7-Eleven locations also featured CIBC ATMs—in June 2012, these machines were replaced with ATMs operated by Scotiabank. 7-Eleven abandoned the Ottawa, Ontario, market in December 2009 after selling all of the six outlets to Quickie Convenience Stores, a regional chain. Following concerns over the fate of Speak Out Wireless customers, Quickie offered to assume existing SpeakOut customers and phones into its Good2Go cellphone program. 7-Eleven is similarly absent from the Quebec market due to its saturation by chains like Alimentation Couche-Tard, Boni-soir as well as independent dépanneurs. Supermarket News ranked 7-Eleven's North American operations No. 11 in the 2007 "Top 75 North American Food Retailers," based on the 2006 fiscal year estimated sales of US$15.0 billion. Based on the 2005 revenue, 7-Eleven is the twenty-fourth largest retailer in the United States. As of 2013, 8,144 7-Eleven franchised units exist across the United States. Franchise fees range between US$10,000 – $1,000,000 and the ongoing royalty rate varies. 7-Eleven America has its headquarters in the Cypress Waters development in Irving, Texas. Small-size Slurpees are free on "7-Eleven Day", on July 11. In the U.S., many 7-Eleven locations previously had filling stations with gasoline distributed by Citgo, which in 1983 was purchased by Southland Corporation (50% of Citgo was subsequently sold in 1986 to Petróleos de Venezuela, S.A., with the remaining 50% acquired in 1990). 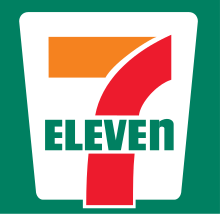 Although Citgo was the predominant partner of 7-Eleven, other oil companies are also co-branded with 7-Eleven, including Fina, Exxon, Gulf, Marathon, BP, Shell, Chevron (some former TETCO convenience stores were co-branded with Chevron, and Texaco prior to the 7-Eleven purchase in late 2012), and Pennzoil. Alon USA is the largest 7-Eleven licensee in North America. The first 7-Eleven in Australia opened on August 24, 1977, in the Melbourne suburb of Oakleigh. The majority of stores are located in metropolitan areas, particularly in central business district areas. Stores in suburban areas often operate as petrol stations and most are owned and operated as franchises, with a central administration. 7-Eleven bought out Mobil's remaining Australian petrol stations in 2010, converting them to 7-Eleven outlets, resulting in an immediate and unprecedented overnight major expansion of the brand. In South Australia all Mobil petrol stations were sold to Peregrine Corporation and Branded as On The Run petrol stations. In August 2015, Fairfax Media and the ABC's Four Corners program reported on the employment practices of certain 7-Eleven franchisees in Australia. The investigation found that many 7-Eleven employees were being underpaid at rates of around A$10 to A$14 per hour before tax, well under the legally-required minimum award rate of A$24.69 per hour. After these reports came to light and received widespread attention, some employees had alleged to Fairfax Media that they had begun to be paid correctly through the 7-Eleven payroll system, however would then be asked by the franchisee to pay back half their wages in cash. 7-Eleven subsequently announced they would fund an inquiry to investigate instances of wage fraud. The inquiry is to be conducted by an independent panel chaired by former ACCC chairman Allan Fels, and with the support of professional services firm Deloitte. The inquiry invited submissions from current and former 7-Eleven employees who allege they have been underpaid, and assess each individual claim. In September 2015, chairman Russ Withers and chief executive Warren Wilmon both announced they will resign from the company. Deputy chairman Michael Smith replaced Withers, while Bob Baily was appointed as interim chief executive. ↑ "Fun Facts - 7-11 Corporate". 2016. Retrieved August 9, 2016. 1 2 3 "7-Eleven History" Retrieved July 20, 2012. ↑ Smith, K. Annabelle (30 May 2013). "We Have Texas to Thank for the Biggest Big Gulp". Retrieved 19 October 2016. ↑ "Bloomberg on 'Big Gulp' law: Not banning anything, just portion control". cbsnews.com. CBS News. March 10, 2013. Retrieved October 19, 2016. ↑ "7-Eleven, Inc. Partners with PT. Modern Putra Indonesia in Master Franchise for 7‑Eleven Stores in Indonesia". 7-Eleven, Inc. April 6, 2009. Archived from the original on September 9, 2010. Retrieved July 11, 2010. ↑ 7–11 around the world (company corporate information), JP: SEJ, June 30, 2016 . ↑ Number of Stores in each administrative division (company corporate information), JP: SEJ, June 30, 2016 . ↑ "Solar Convenience Stores", Tokyo Weekender, May 9, 2012, retrieved September 26, 2012 . ↑ "7-Eleven buka cawangan ke 2,000". Retrieved October 29, 2016. 1 2 Sahoo, Sananda (June 17, 2014). "7-Eleven to open in Dubai next year, first in Middle East". The National. Retrieved June 19, 2014. 1 2 Kim, Chang-Ran; Shimizu, Ritsuko (June 17, 2014). "Seven & I to open 7-Eleven in Dubai next year, first in Middle East". Reuters. Retrieved June 19, 2014. ↑ "7-Eleven – A Strong Brand". Franchise.7-eleven.com. Archived from the original on November 14, 2010. Retrieved August 8, 2010. ↑ Pilieci, Vito (October 30, 2009). "7-Eleven unplugs phone deal, moves Hundreds of cellphone owners left on hold by sale to Quickie". Ottawa Citizen. Retrieved December 12, 2009. ↑ "Attention... Speak Out Customers are Good 2 Go...". Quickie. Retrieved December 12, 2009. ↑ "7-Eleven Inc.". Entrepreneur. Entrepreneur Media, Inc. 2013. Retrieved November 10, 2013. ↑ "7-Eleven's new Irving corporate heaquarters campus gets $41.5M loan - Dallas Business Journal". Retrieved 2016-07-03. ↑ "7-Eleven Buys 183 ExxonMobil Locations in Florida". Convenience Store Decisions. Harbor Communications. December 9, 2010. Retrieved June 7, 2016. ↑ "7-Eleven® Signs Agreement with ExxonMobil To Acquire 51 North Texas Locations Retailer Continues Accelerated Store Growth". 7-Eleven News Room. 7-Eleven, Inc. August 16, 2011. Archived from the original on November 10, 2013. Retrieved November 10, 2013. 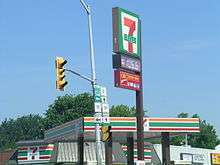 ↑ "7-Eleven Acquires Mobil Retail Fuels Business". Retrieved October 29, 2016. 1 2 3 4 Ferguson, Adele; Danckert, Sarah; Klaus, Toft (August 29, 2015). "7-Eleven: Investigation exposes shocking exploitation of convenience store workers". Sydney Morning Herald. Retrieved October 2, 2015. ↑ "Age journalists recognised at Walkley awards". The Age. 2015-12-03. Retrieved 2016-08-30. ↑ "7-Eleven Class Action Looms for Disaffected Franchisees". 2015-12-07. Retrieved 2016-08-30.